A Russian Soyuz booster rocket has failed in mid-air less than two minutes after take-off on Thursday, forcing the crew to make an emergency landing with the help of NASA and technicians on the ground. 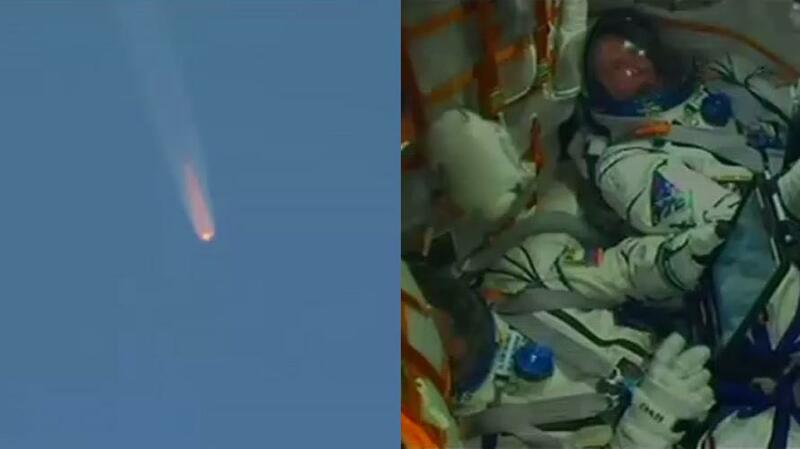 Russian cosmonaut Aleksey Ovchinin and NASA astronaut Nick Hague were en route to the International Space Station in the Soyuz MS-10 spacecraft; however the booster suffered engine failure based on an apparent malfunction a mere 119 seconds after liftoff, causing them to have to immediately abort the mission. Moments after the problem they separated the rocket from their vessel, only to make a dramatic "ballistic descent" in Kazakhstan, according to reports. The pair, who were on their way to the International Space Station (ISS), transporting gear for scientific experiments that were to be conducted at the ISS, were unhurt in the reentry and landing. Helicopters reportedly scrambled for the emergency rescue, which required the two to exit the capsule as quickly as possible. The dramatic rescue operation was monitored and updates were streamed from the NASA command center. NASA commentator Brandi Dean in NASA mission control at the Johnson Space Center in Houston reported the Soyuz MS-10 capsule had made an emergency landing after a "ballistic" descent, a normal but steeper-than-usual trajectory back to Earth. Dean said the Soyuz descent module landed near the town of Dzhezkazgan, Kazakhstan, a familiar staging point for support personnel in normal Soyuz re-entries from space. Dean reported recovery crews were in radio contact with Ovchinin and Hague and that both crew members were in good condition. She said that while the Soyuz crew would have been "subjected to higher G-forces" during to the ballistic descent, it is a "known mode of descent" that the crew would have been versed in. The search and recovery teams have reached the Soyuz spacecraft landing site and report that the two crew members, Nick Hague of NASA and Alexey Ovchinin of Roscosmos, are in good condition and are out of the capsule. Search and recovery teams are with the crew now. Roscosmos is forming a state commission to investigate today's Soyuz launch incident. It is as yet unclear exactly what caused the stage 2 rocket booster failure. As the capsule descended to earth, the astronauts experienced a period of free-fall as they made re-entry and descent. According to reports: "A problem with the Soyuz MS-10/56S's booster was behind the aborted mission, Dean said from Johnson Space Center. The crew reported at one point, relayed through a Russian translator, they were weightless as the capsule flew free on its own." Curiously, at some point air-to-ground communications with the crew were cut off for unknown reasons, though its believed that the Russian space agency set the communications loop to private or possibly due to malfunction during the rapid descent.